It was raining without a break and the traffic was heavy as usual. Holding on to the bar of the bus, Shanta was annoyed at the snail’s pace at which her bus was moving. Loads of work done and even more to accomplish … the thought of losing time in between made her wonder why the monsoon had arrived on schedule! Being the headmistress of a local, family-run school required her to be punctual. She kept thinking, “Rajettan does not take any initiative to solve my problems. I have told him several times that I need to learn to drive at least a two-wheeler to be on time. One more vacation has gone by and I did not learn anything.” “Vypeen”, “Vypeen” the conductor’s scream drew the curtain on the thoughts that were crossing her mind. A school in the coastal town where majority of the children were the wards of fisher folk. The risk involved going into the sea to fetch their catch or ‘chakara’ as it was known in Kerala. This made the fishermen realize the need for a good education for their ‘little future promises’. Back home, in the evening, Shanta, switched off all the lights, and pushed open the wooden latch of the main door, which slid into its space with a screech. Ammamma (grandma), an octogenarian, waited for Shanta to come home and sit beside her and massage her legs until she slept. “That’s enough dear, go take rest as you have to go early tomorrow.” With a smile on her face, Shanta went to her bedroom, opened the cupboard, took out a couple of her six year old son’s t-shirts and shorts, packed them up and put the packet into her bag. The next day when Appu came dripping as usual, Shanta called out, “Appu…come here. 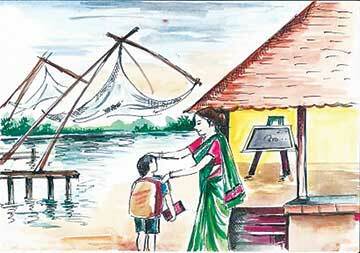 Why are you coming late and wet every day?” Shivering with fear, Appu said, “I don’t have an umbrella, teacher. I have to tether my calf in the field and then come running to school. My grandmother is too old to do all that. Sorry, I will come on time tomorrow, teacher,” he pleaded. Knowing that Appu lost his mother a couple of years ago, Shanta refrained from asking any further questions. Instead she took him to her office and gave him a t-shirt and shorts to change into. Though a little reluctant, Appu accepted it and walked back to his class warm in his new clothes and his wet clothes in a packet. The t-shirt had a nice smell…the smell that used to come from the cupboard in which his mother used to keep his clothes. Appu was a happy lad that day, maybe because he experienced a positive stroke of love and care. Looking through the windows of her room, Shanta saw a cheerful Appu who was more enthusiastic than usual that day at play. It was half past midnight, Shanta woke up with a jolt. It was raining heavily, there was thunder and lightning too. Soon the power went off and there was total darkness. While trying to recall her dreams, Shanta felt a shiver run through her. Meanwhile, huge waves strike Appu who was trying hard to reach the shore in a small boat. With the power back, Shanta ensured that her son Siddhu was safe and asleep. Tossing and turning on her bed, Shanta could not slide into slumber. Appu and Siddhu were alternately flashing in her mind. The angry spell of rain slightly subsided, the frogs began to croak, crickets gave out deafening sounds and Shanta felt an unusual lull. The officials rushed back to the coastal area promising they would let her know when they received some information. Accompanied by two male teachers and Malini, Shanta went to the coastal area where the fishermen lived. While walking, Shanta wondered, with the sea as their mother or ‘kadalamma’ as they fondly called her, the fishermen relied entirely on her …their catch for the day and above all, a safe return from the sea after the catch. Many families lived there in thatched huts by the shore. Hygiene and sanitation took a backseat here. Children like Appu, Thambu, Kandan, all of them lived here. She recalled, once when it was her turn to take class, Shanta had asked the children to draw a landscape. Shanta appreciated the children for their beautiful imagination but within she was sad because all pictures either had a sea, a boat, or a fishing net. Isn’t there a life beyond this for these kids? Aren’t they aware of anything more beautiful than the sea or the seashore? She felt a big load of responsibility descending on her. “Next Monday onwards, we will visit all the important places in our town,” she had announced in her class. She wanted to open the windows of their world beyond the sea and the seashore. Everyone was provided with a letter pad and a pencil to jot down all that they saw. In a specially arranged bus, the students were taken to the Dutch Palace, the Jewish synagogue, the High Court, the Kerala Museum, the handloom weaving centre, the Basilicas…. The young ones were thrilled. At the end of each visit, one student spoke about it during the Assembly. Shanta felt so satisfied and happy listening to the sincere attempts of the students. My mission is accomplished…she felt. But the toil behind this endeavour was not an easy one. “Where do we get the funds from?” “We have to hire a van for a day and that too for more than one Monday. Do you think it is feasible?” the Manager was doubtful. “Sir, the students have to know about the world outside. They have to be sensitised and made aware of it,” said a confident Shanta. “We can afford a small percentage and for the rest we will find sponsors from outside,” replied the Manager. “Okay, Sir, we will look out for sponsors,” she said. Malini and Shanta had quickly shopped for some articles to make cloth bags and within a week they completed them and put them up for sale in the nearby shops. Having raised some money they made pamphlets highlighting the need to sponsor the visits for these underprivileged children. After school hours, they distributed the pamphlets to the local businessmen who owned buses and others who owned export businesses. This fetched them enough to pay for the visits, which were paced out over the month. Soon, the children were ready to put up their exhibits on the wall. Shanta added her photographs of the study tours to the reports of the students and that was well appreciated by all. All these thoughts crossed her mind as she was walking towards the coastal area. Her feet sank deep into the mud and she stood still when she saw the devastation before her. Out in the sea many life-guards and other safety personnel were searching the waters. Shattered huts, dead cows, dogs … the smell of death was everywhere…. Unable to bear the sight, Shanta walked back quickly with a heavy heart. The others were identifying the little speechless ones. Suddenly, Shanta heard a faint voice asking for help from a half destroyed hut. Peeping in she saw Appu lying there crying for help. He was trembling with high fever. Nobody else was to be seen there. Seeing Appu in Siddhu’s dress, Shanta could not control her emotions. At the hospital, Shanta pleaded with the doctor to attend to Appu. “We will do our best,” assured the doctor. Recollecting these incidents with pain and gratitude, the District Collector Appu Koran wiped his tears. “Leaving a mark, not in the annals of history but in the minds and the hearts of young ones lasts longer and stronger. This can be achieved only by teachers like Shanta,” said the Collector. Usha Prabhakar teaches economics at Vidyodaya School, Thevakkal, Kochi. She can be reached at ushacprabhakar@gmail.com.